The 2:00 a.m. call is the first time Lexie Vidler has heard her sister’s voice in years. Annie is a drug addict, a thief, a liar—and in trouble, again. Lexie has always bailed Annie out, given her money, a place to sleep, sent her to every kind of rehab. But this time, she’s not just strung out—she’s pregnant and in premature labor. If she goes to the hospital, she’ll lose The 2:00 a.m. call is the first time Lexie Vidler has heard her sister’s voice in years. Annie is a drug addict, a thief, a liar—and in trouble, again. Lexie has always bailed Annie out, given her money, a place to sleep, sent her to every kind of rehab. But this time, she’s not just strung out—she’s pregnant and in premature labor. If she goes to the hospital, she’ll lose custody of her baby—maybe even go to prison. But the alternative is unthinkable. To ask other readers questions about Before I Let You Go, please sign up. Who is Mary Walters? The social worker’s name at the beginning of the book is Mary Rafferty and then near the end they talk about Mary Walters? Does anyone know if the religious sect is based on Exclusive Brethren? It sounded very very much so - doesn't really matter, but was curious. After falling in love with Kelly Rimmer’s previous novel “ A Mother’s Confession ”, I was thrilled to have the opportunity to read this upcoming novel. Instantly, Lexie can tell her sister is high, and angrily tells her to go to the hospital. Her fiancé, Sam is now awake and seems surprised at her tone. However, this isn’t the first middle of the night call she’s received from her little sister…. But Lexie is completely unprepared for what Annie says next…. “Lexie, I’m pregnant. I can’t go to the hospital. I just can’t”. Lexie has always tried to be there for Annie. When they were young, their father died and their mother went to pieces. Emotionally they were on their own and so Lexie was the one who stepped up to take care of Annie. Lexie had always promised her father that she would take care of Annie. But when Annie pulled a stunt two years earlier that almost got Lexie fired, she knew she had to cut ties with her sister. But THIS is different. This time it’s not just Annie that needs her. So much is riding on Annie getting clean. Lexie wants to advocate for her sister, but their complicated past has left her with mixed feelings. For Annie to get better and to heal, she will need to address the issues she’s tried to suppress by self-medicating. The secrets she kept from everyone….including Lexie. Wow! Once again, Kelly Rimmer has written a book that I couldn’t put down. I was hooked from the start and became completely engrossed in the story and its characters. I could relate to the sister's complicated relationship. Because of my own experiences and relationships, some parts of the book hit me very hard. I was emotional and even angry at times. It made me question some of my own pre-conceived notions. And though I’ve finished the book…I can’t stop thinking about it. This was definitely a thought-provoking read with some controversial issues that could help start some important discussions. The author has obviously done her research and I feel like the story was well-balanced, honest, realistic, and of course, interesting. “ Before I Let You Go” is a well-written and poignant book about love, family, addiction, abuse, loss, and forgiveness. Another great read from Kelly Rimmer that I won’t soon forget. This is a story about addiction. It involves family secrets that test the strength of the bond of sisters. This novel will challenge you to examine your thoughts and feelings toward addiction and the effects it has on the addict as well as their families. My mind was swimming with my thoughts and reactions as the story progressed. I questioned myse 5 stars! This was a touching and emotional novel that affected me deeply. I have not stopped thinking about these characters since I finished reading. This is a story about addiction. It involves family secrets that test the strength of the bond of sisters. This novel will challenge you to examine your thoughts and feelings toward addiction and the effects it has on the addict as well as their families. My mind was swimming with my thoughts and reactions as the story progressed. I questioned myself constantly throughout the pages of this novel, asking how I would react and I really struggled to find my answers (some answers I still have not yet found). A big thank you to NetGalley, HARLEQUIN – Graydon House Books and Kelly Rimmer for providing an ARC in exchange for an honest review! Lexie Vidler’s relationship with her sister Annie has always been complicated. Their childhood wasn’t like most families and Annie always relied on her sister as a mother figure. When Lexie gets a call at 2 a.m. after not hearing from heard sister for years, she knows something is wrong. Something bad. But then something is always wrong with Annie. Annie is a drug addict. Has been for years. This time however, it’s not just drugs that Annie has a problem with. Annie is strung o 4 Emotional Stars. Lexie Vidler’s relationship with her sister Annie has always been complicated. Their childhood wasn’t like most families and Annie always relied on her sister as a mother figure. When Lexie gets a call at 2 a.m. after not hearing from heard sister for years, she knows something is wrong. Something bad. But then something is always wrong with Annie. Annie is a drug addict. Has been for years. This time however, it’s not just drugs that Annie has a problem with. Annie is strung out and extremely pregnant and Annie needs medical attention. Where they live in Alabama, it’s a felony to use drugs while pregnant, thus if Annie gives birth in the hospital, she will lose custody of her baby and go to prison. Yet Annie calls her sister, - her sister - the doctor (whose boyfriend is also an M.D.). Lexie wants to help and she only knows one way to do so. Soon Lexie and her boyfriend Sam’s life is turned upside down, caring for Annie’s daughter Daisy, while Annie is in court ordered rehab. “Before I Let You Go” by Kelly Rimmer - expertly delved into the subject of drug addiction and how it affected two sisters and their families, as well. Heart wrenching doesn’t begin to cover it. As I said, addiction is a family disease. It is not a label and everyone has a story. Lexie and Annie’s is a powerful one. The characters make you feel, they tear at your heart, make you anxious, make you angry and make you cry. “Before I Let You Go” is a novel that captures a lot of emotions and is one that I highly recommend. Thank you to Edelweiss, Harper Collins and Kelly Rimmer for an ARC of this novel to read and review. "There is no off switch to the love between sisters; no way to pause it, no way to destroy it." This story was both a heartbreaking and heartwarming tale of the love between two sisters. Annie is a drug addict facing the biggest problem of her life. She is strung out, pregnant and in premature labor. Not knowing what else to do she calls her big sister, Lexie, for help. Lexie has always been more of a mother than a sister to Annie. She has always stepped in to help her little sister throughou "There is no off switch to the love between sisters; no way to pause it, no way to destroy it." This story was both a heartbreaking and heartwarming tale of the love between two sisters. Annie is a drug addict facing the biggest problem of her life. She is strung out, pregnant and in premature labor. Not knowing what else to do she calls her big sister, Lexie, for help. Lexie has always been more of a mother than a sister to Annie. She has always stepped in to help her little sister throughout the trials of her life, with unwavering love and compassion. "Addiction is, in that way, just like love—in the early moments, you don’t see the potential for it to bring you pain—it’s just something you slide into between laughs and smiles and moments of bliss. It’s something that feels like a shield, until you realize it’s actually a warhead, and it’s pointed right at you." Annie's addiction was fueled by her childhood. The early loss of her father and the traumatic years that followed led her down a dark path where drugs offered her the only escape she felt worthy of having. Now, she is faced with jail time and the possible loss of her daughter if she doesn't complete a rehab program and remain sober. The story is told in alternating voices between Lexie's perspective as she struggles to take care of her newborn niece and Annie's journal entries. The journal entries offer insight into how Annie ended up the way she did and they are heartbreaking in their honesty. Aside from the obvious bond between the sisters another aspect I really enjoyed from the book was Lexie's fiance, Sam. What an amazing man! Honestly, I know he was fictional but he seriously made me swoon. He was so patient, loving and compassionate. On the other hand, I was so infuriated by Lexie & Annie's mother. I just wanted to shake her to knock some sense into her! "It’s funny how every single thing in your life can shatter with a single decision." 3.5 A subject that is important and one has not been explored enough in fiction. A pregnant woman, addicted to heroin,who will lose her child and have to serve prison time. A law, which I never knew, that is enforced in some states. At first I had a hard time not being judgemental, having a baby that has to go through withdrawal, just such a horrible thing. Once I read Annie's story though I felt equally sorry for her and what she has gone through. As my grandmother used to tell us, everyone has 3.5 A subject that is important and one has not been explored enough in fiction. A pregnant woman, addicted to heroin,who will lose her child and have to serve prison time. A law, which I never knew, that is enforced in some states. At first I had a hard time not being judgemental, having a baby that has to go through withdrawal, just such a horrible thing. Once I read Annie's story though I felt equally sorry for her and what she has gone through. As my grandmother used to tell us, everyone has a story, and it is certainly true here. Lexie, her older sister, a doctor who has tried to help Annie numerous times, tries to help her again. Taking on the task of caring for the infant, Daisy while Annie goes to rehab. Completing rehab a court imposed mandate if she wants to avoid jail time and ever having a chance of reclaiming her child. Unfortunately I didn't taeto Lexie's character as much as I did Annie's. For a doctor she seemed over emotional, not the capable person she was supposed to be. Repetitive thoughts and actions, whiny at times, which I felt stalled the plot. Also her fiance seemed to good too be true. Alternating between controlling and supportive. Something about him bugged me. So another mixed read for me, good story for the most part, very worthy subject and a characters terrific, Annie that will frustrate you but who you can't help pulling for. A sisters read with many of us falling on different ends of the rating spectrum. Made for some good discussions though as I'm sure everyone's life experience had a play in their reception of this novel. Lexie gets a phone call at 2 am from her sister, Annie. She hasn't heard from her in years. She finds out that Annie is pregnant, but she won't go to the hospital, because she is afraid that she can't pass a drug test. Annie is a drug addict. She has failed over and over again to get clean and sober. If she goes to the hospital, she knows that she will lose custody of her baby. She might even have to go to prison. Lexie has always been there for her sister. They both share a strong bond of a ter Lexie gets a phone call at 2 am from her sister, Annie. She hasn't heard from her in years. She finds out that Annie is pregnant, but she won't go to the hospital, because she is afraid that she can't pass a drug test. Lexie has always been there for her sister. They both share a strong bond of a terrible painful childhood. Lexie has her hands full. She is a doctor and plans on getting married soon. They both live different lives. Lexie is in danger of losing her job. Annie is in Rehab and writes her story through letters that are long buried secrets from the sister's childhood. This was such a heartbreaking story. I just loved Annie. It had me in an emotional mess. The author shows that addiction affects every member of the family. The author did a great job telling both sides of the story, Annie, the addict, and Lexie the family member, who is affected by her sister's addiction. Their childhood was such a terrible painful past. This book made me feel, I was in tears in certain parts of the story. This book covers so many emotional issues and difficult subject matter. I thought Lexie did everything she could do to help her sister. This was a page turner for me. I just wanted to find out what happened next. I loved the characters. I had empathy for Annie, Lexie and Sam. Make sure you have tissues handy, while reading this book. This was a Traveling Sister Read and it was a great discussion and I really enjoyed reading this with them. Two sisters: one a physician the other a drug addict. One whose unborn baby's life is at risk. The consequences of being an addict and having your parental rights stripped. Then the struggle of doing what's right despite the love you have which has become a codependency. The sacrifices made. This was a surprisingly engaging story told from both sister's POV. It is also a foray into the depths of addiction and the struggle to come clean. The good days; the bad. The hopelessness and despair along wi Two sisters: one a physician the other a drug addict. One whose unborn baby's life is at risk. The consequences of being an addict and having your parental rights stripped. Then the struggle of doing what's right despite the love you have which has become a codependency. The sacrifices made. It is also a foray into the depths of addiction and the struggle to come clean. The good days; the bad. The hopelessness and despair along with the strength required to get well; and the long road to healing and the necessary support systems that need to be in place to recover. Rimmer delivers a blunt story of sobriety, of the legalities around pregnant addicted women and the stigma that attaches itself to them. Every once In a while you need to embrace a story that brings you back down to reality and allows you to express pent up emotions. "Before I Let You Go" by USA bestselling author Kelly Rimmer, is just that book! I guarantee by the time you've finished reading it you'll have used up a box of tissues and given yourself an awful lot to ponder over. Although I don't have a sister, I could still understand and sympathise with Lexie's torment at her sister Annie's predicament and sympathised at how he Every once In a while you need to embrace a story that brings you back down to reality and allows you to express pent up emotions. "Before I Let You Go" by USA bestselling author Kelly Rimmer, is just that book! I guarantee by the time you've finished reading it you'll have used up a box of tissues and given yourself an awful lot to ponder over. Although I don't have a sister, I could still understand and sympathise with Lexie's torment at her sister Annie's predicament and sympathised at how her once extremely loving and devoted relationship became so estranged. The heart-pounding dilemma she is faced with is heartbreaking and caused such repercussions you could never have foreseen. I was very surprised to learn that since 2006 the state of Alabama has a chemical endangerment legal code. I had never heard of this legality before and after reading the book I felt the need to research it and did indeed find that substance abuse in pregnancy is a criminal offence in some US states. The story that Kelly has written is based on a young woman, who heavily addicted to heroin, finds herself pregnant and in need of medical assistance and who will be prosecuted if she doesn't successfully complete rehab. Addictions are very easy to acquire and the chemical hit addicts get make it very hard to beat it. Pregnant women should be given help and not penalised if they struggle to cope with rehab and this story really hits home the ordeal women must go through in these situations. "Before I Let You Go" offers a tremendous amount for a rigorous debate and would definitely make a fantastic book group read for this reason. I thoroughly enjoyed Annie's story through the telling of her written journal and it was at times heartbreaking to read her thoughts and emotions as she went through a very traumatic childhood and troubled adult years. Heartbreakingly poignant and desperately sad at times, I will always remember this book and I very much intend to read more of Kelly Rimmer's work. Her story telling is superb and I defy anyone who enjoys women's fiction not to get emotionally attached to this book. I only wish I could give this book more than five stars, it's worth so much more and I wholeheartedly recommend it and it's author to everyone! KELLY RIMMER delivers a compassionate, thought-provoking and well-written story here that touches on so many emotional issues and the sensitive subject matter of addiction. The story was told in 4.5 stars! Thank you so much to NetGalley, Harlequin - Graydon House Books and Kelly Rimmer for the opportunity to read an advanced copy of the book in exchange for a review! COULEE is a term applied rather loosely to different landforms, all of which refer to a kind of valley. I really love this novel, and here are a couple reasons why: One, Rimmer is sympathetic to both addicts and the family members dealing with addicted love ones. Two, Rimmer is a hugely talented writer. The story is about two sisters who have been estranged for two years because one of them has battled drug addiction for years. Lexie is the together sister—a doctor who is engaged to a wonderful man. Annie is the sister who has battled drug addiction. Lexie is used to getting late-night calls of req I really love this novel, and here are a couple reasons why: One, Rimmer is sympathetic to both addicts and the family members dealing with addicted love ones. Two, Rimmer is a hugely talented writer. The story is about two sisters who have been estranged for two years because one of them has battled drug addiction for years. Lexie is the together sister—a doctor who is engaged to a wonderful man. Annie is the sister who has battled drug addiction. Lexie is used to getting late-night calls of requests for help from Annie. She’s put her in rehab, giving her a place to stay, tried to be understanding. She knows addiction is a disease, but it’s frustrating and heart-breaking nonetheless. But this late-night call is different—Annie tells her that she’s pregnant, and because she has still been getting high, she can’t go to the hospital or she risks losing the baby to social services. Lexie and her fiancé Sam rush to help her. Annie is in premature labor and will die if she doesn’t get to the hospital. What follows is a harrowing tale of Annie trying to get clean and keep custody of her baby and Lexie doing her best to advocate on her behalf. The recovery rates for people with substance abuse issues are abysmal. Rimmer deals with the subject with compassion and objectivity. This is a must-read for sure. probable cause & secrets withheld, the struggle to ‘get sober’, pregnancy drug addicted and the complex consequences: ‘the health of the baby’, legal ramifications, rehab, and emotional toll on not only immediate family members - but their partners too. Wonder who’ will be left behind? It’s all good- you’ll be engaged!!! This is one excerpt - an example- that allowed me to see deeper layers into her struggle. “Sometimes I get high purely to escape the guilt of how much I’ve hurt her...and of course, I hurt her by using, so then I feel worse, and I use again, and it just goes on and on”. Before I Let You Go is such an emotional and heart breaking read... this definitely tugged on my heart strings! Kelly Rimmer ever so gracefully pours her beautiful words across the pages of this novel about loss, addiction, strength, and love. Lexie Vidler and her sister Annie have had quite the heart-breaking past with Annie's addiction to heroin. Lexie hasn't spoken to her sister in 2 years and one night gets a phone call at 2 am. Lexie thought she has been through it all with Annie, but her wo Before I Let You Go is such an emotional and heart breaking read... this definitely tugged on my heart strings! Lexie Vidler and her sister Annie have had quite the heart-breaking past with Annie's addiction to heroin. Lexie hasn't spoken to her sister in 2 years and one night gets a phone call at 2 am. Lexie thought she has been through it all with Annie, but her world is quickly turned upside down in 2 seconds after she hears that Annie is pregnant. Lexie has always been there for her sister but this time is different.... she needs to protect her sister and her niece. As you can imagine, there is so much pressure on Annie getting sober for not only herself but her baby. Lexie and Annie have such a deep rooted past with so many un-resolved issues on both of their parts. I can't imagine how Lexie or Annie would feel in this situation. Kelly Rimmer does an amazing job with the characterization in this novel. You can really feel what Lexie is going through and what Annie is going through. Of course, due to Annie's substance abuse CPS became involved in this case very quickly. I am familiar with very similar cases as Annie's situation. I was highly annoyed in the beginning of this novel, because the social worker in this novel was portrayed as the typical stereotype that society associates with social workers (lack of empathy and taking children away from their families). But, as the novel progresses author defines how dysfunctional our foster care system truly is. I see this every single day as a social worker and it's refreshing to see a book that actually portrays this. Addiction is such a heart breaking disease and it affects so many people in different ways and I feel that we need more education on this topic in our society. I enjoyed this novel but I think due to my experience with cases like this I saw the outcome of the novel about 30 percent in. I also felt like the character of Lexie was a little repetitive with her feelings and felt that the author could have taken a bit of a back seat with this. Overall, 3.5 stars for me on this one. This was a traveling sister read and I enjoyed each sister's viewpoint on this difficult topic of addiction. Thank you to Netgalley and Harlequin for an advanced arc in exchange for my honest review. Despite the title and cover, Before I Let You Go is not another psychological thriller — so many thrillers have similar titles. No, it’s a heartfelt story about sisters, addiction, grief and abuse. Lexie and Annie lost their father as children, after which their mother moved them to a very insular and strict religious community. Lexie left first and then Annie followed her. Flash forward several years and Lexie is a doctor and Annie is pregnant and addicted to heroin. The story is told primarily Despite the title and cover, Before I Let You Go is not another psychological thriller — so many thrillers have similar titles. No, it’s a heartfelt story about sisters, addiction, grief and abuse. Lexie and Annie lost their father as children, after which their mother moved them to a very insular and strict religious community. Lexie left first and then Annie followed her. Flash forward several years and Lexie is a doctor and Annie is pregnant and addicted to heroin. The story is told primarily from Lexie’s perspective starting towards the end of Annie’s pregnancy. There are also a few chapters from Annie’s perspective in the form of diary entries that recount her childhood moving forward. I have given Before I Let You Go 4 stars because it had me fully emotionally engaged and I felt that the author really did justice to the real time pain, emotions and political, social and legal issues of the situation. Besides the story, the author is overtly trying to raise awareness about how the law treats pregnant women who have addiction issues, and she generally does a good job. If I focused on literary merit, my rating would likely be lower. It got long and repetitive in places, and it did a bit too much saying rather than showing. But, in fairness, addiction involves lots of waiting, false hopes, guilt and blaming, and the rhythm of the book captures that dynamic really well. While the characters other than Lexie and Annie are a bit simplistic, the dance between Lexie and Annie is really potent. As I say, I found myself fully emotionally engaged in their story and I have a lot of respect for the author’s point of view on the topic she deals with. Her perspective on addiction is not simplistic, and for that reason alone this novel is worthy of attention. I was immediately drawn to the story and characters in this book. Even though it touches on some very sensitive and troubling themes mainly drug abuse, it was well executed to show two sides of the coin. One of drug addict and also the family affected. I found this a honest and realistic portrayal and the two sisters at the core of this story really touched a nerve, the bond and then the destruction of that bond was heartbreaking, I was impressed how the author managed to really capture the topi I was immediately drawn to the story and characters in this book. Even though it touches on some very sensitive and troubling themes mainly drug abuse, it was well executed to show two sides of the coin. One of drug addict and also the family affected. I found this a honest and realistic portrayal and the two sisters at the core of this story really touched a nerve, the bond and then the destruction of that bond was heartbreaking, I was impressed how the author managed to really capture the topic in such a tender and non judgemental way in showing that drug addiction is a disease and the addicts themselves need understanding, care and ultimately unconditional love but sometimes even those things just aren’t enough, by the end I was literally reduced to tears, but I was not sad I read it. I highly recommend this book but just have some tissues on hand..you’ll need it. Kelly Rimmers does an excellent job compassionately creating our main characters here with Annie and Lexie as they deal with Annie’s drug addiction and an unjust law and the trauma of their past. She realistically captures Annie’s addiction and Lexie Before I Let You Go grabbed my heart from the first page and didn’t let go of it. Kelly Rimmer skillfully writes with compassion and honesty as she explores the bond between two sisters from their traumatic childhood and to the crisis they now face. Kelly Rimmers does an excellent job compassionately creating our main characters here with Annie and Lexie as they deal with Annie’s drug addiction and an unjust law and the trauma of their past. She realistically captures Annie’s addiction and Lexie’s feelings of guilt, desperation, and anxiety for Annie without forcing any emotions on her readers but allowing us to feel our own. Kelly Rimmer brings insight and understanding to the reality of addiction for people who experience it and their families. The day Lexie and Annie's father died was the catalyst to change - nothing was the same in the aftermath. Their mother was unable to cope, and Lexie, being the older of the two sisters, took over. She prepared meals, got them both ready for school, did the laundry - she grew up quickly. Twelve months later Robert appeared in their lives; their mother married him and Lexie and Annie had a step-father they hated. But the bond between the two girls continued to grow with Lexie always there for Annie The day Lexie and Annie's father died was the catalyst to change - nothing was the same in the aftermath. Their mother was unable to cope, and Lexie, being the older of the two sisters, took over. She prepared meals, got them both ready for school, did the laundry - she grew up quickly. Twelve months later Robert appeared in their lives; their mother married him and Lexie and Annie had a step-father they hated. But the bond between the two girls continued to grow with Lexie always there for Annie. When Lexie turned sixteen, she left Annie and her mother, determined to make her way into the future. But what would Annie do? How would she manage without her sister by her side? What would be the outcome for Annie and Lexie? For the little baby who would have neonatal abstinence syndrome (NAS) when born? Being doctors, both Lexie and Sam knew and had seen babies affected with NAS - it was horrific. But could Annie put her baby first? Before I Let You Go by Aussie author Kelly Rimmer was an outstanding, emotional and ultimately horrific story of how life can change in an instant. How love and guilt are entwined forever, and how the decisions one makes can make or break - that fork in the road is never clear. A fast-paced, suspenseful novel that I couldn't put down, Before I Let You Go is one I highly recommend. Two sisters face some life changing decisions. Lexie is the older, successful sister and Annie is broke and addicted to drugs. The paths they have chosen couldn’t be more different. Lexie hasn’t been able to save her sister from addiction, but things are different now. Annie is pregnant, and she is asking Lexie for help. Prepare to have some tissues ready. I was teary eyed at several passages and could feel the emotions that both sisters were experiencing. We get the backstory, some journal entries, and some heartbreaking scenes. Lexie’s story was at times repetitive and seemed to stall the flow of the plot too much for me (which took away from my enjoyment of it). I placed myself in Lexie’s shoes and kept asking myself what I would have done. It is an important story about addiction and the heart heavy impact it has on families. Themes of abuse, addiction, love and the ability to forgive all make this a thought provoking read. Thanks to the publisher for my ARC. This was a Traveling Sister Group read with all the lovely ladies. This sad yet utterly poignant story illuminates for the reader, all the effects an addiction can do to both the person addicted and the family that surrounds that person. Lexie and Annie Vidler are sisters growing up in a loving household until tragedy strikes and they are propelled into a nightmare. After the loss of their father, the mother spirals into deep depression until she meets a man Robert who is one of the leaders of a cult like religion which ensnares the mother, who marries Robert, and makes the girls follow along to a village where the cult lives with a nightmare of harsh rules, dress, and elimination of outside contact with the world which rules all their lives. Lexie plays along while Annie revolts with every bone in her body and is subjected to cruelty being beaten and other horrendous things at the hands of Robert, their new father. Lexie escapes and Annie is left to face the horrible situations she is often found in and years later, a total mess with loss of self esteem and pride escapes as well. Is it any wonder that Annie succumbs to the lure of first alcohol and then heroin to dull the hurt and pain. After becoming a full blown addict, whom Lexie has tried to help through a series of rehabilitation, that never works for Annie, years of no contact go by until one late night Lexie receives a phone call from Annie begging for help for she is pregnant and addicted. Lexie now a doctor, lives with her fiance, Sam, another doctor. They rush to help Annie finally convincing her that for the sake of this child she needs a hospital knowing that the hospital will be forced to alert child protective services of the mother's addiction and the child's state and welfare because of it. From this point in the story, Annie must be placed once again in rehab. She must continue the program or else she will be placed in prison and lose her child. Lexie and Sam step forward to take the child until Annie completes rehab and the court determines her able to provide for the child. It all depends on Annie. Can she do this? Can she become drug free, responsible, and able to take and provide for a child? The cards are definitely stacked against her and as through letters written both to her drug counselor and then to Lexie we learn of the tragedies that have occurred to Annie from an uncaring mother so hung up with the cult, to an abusive stepfather we see that Annie is destined to fail. Perhaps this time though will be the charm..
Told with much compassion and a wonderful way of stepping inside the characters presented, Ms Rimmer has written a book that is both tragic and compelling. She writes so well of the ravages addiction puts upon not only the user but the family as well. "Addiction is a hugely complex and destructive disease, and its impact can be simply devastating. All to often lives and families can be shattered." (Kate Middleton) For both Lexie and Annie that shattering of family takes the very life and breath out of them, making for such tragedy and pain as they both grapple with its evil effects. Thank you to Kelly Rimmer, the publisher, and edelweiss for making an advanced copy of this tragic novel available to me. This book should firstly come with a warning that it has an emotional punch that even Rocky would be proud of. It starts with a moral dilemma, how far would you go to help a sibling? Is blood thicker than water? Lexie is contacted by her sister Annie as she needs help, she is pregnant and hooked on drugs, desperate for help but afraid to go to the hospital as social services will take her unborn baby away. I started this book disliking Annie and finding her weak, but I had forgotten you shouldn’t This book should firstly come with a warning that it has an emotional punch that even Rocky would be proud of. The moral of this book for me was sometimes you can’t help somebody unless they ask for help and if that is when they reach rock bottom you just have to be patient. The story of Annie’s descent into drugs was beautifully written and will tug at anyone’s heart strings. I read this in the bath with tears streaming down my face! Definitely the most emotive read this year. Two sisters, two very different life outcomes. Lexie is a doctor engaged to Sam who is also a doctor. Annie is a drug addict. Lexie is not surprised when she gets a call for help, from Annie, in the middle of the night. It’s not the first time it has happened. But now Annie is pregnant and that changes everything. Who isn’t intrigued by dysfunctional family stories! I could clearly see from the Facebook discussion for this book that so many readers could relate to the sisters on different levels – unparented children (when the parent is not mentally present), drug abuse, sibling connections. The story is set in Alabama where there are strict laws on drug use in pregnancy and any woman who is reported with drugs in their system whilst pregnant faces criminal charges for child endangerment with a penalty of a jail term. This causes a moral dilemma for Lexie. Should she protect her sister from authorities or protect the unborn child. Lexie and Annie’s story is intense and relatable, it will make you angry and break your heart; it opens up a lot of moral issues for discussion. The dual narration, present day told by Lexie and the past through Annie’s journal entries, had this reader switching allegiances as the full story was revealed. I will finish with this quote from Annie. It just killed me. ” How many thousands of dollars do you sink into a person before it stops being selfless and starts being ridiculous? How many times do you bother to revive someone who is nothing but a drain on you and society?” – Annie Vidler. Sisters Lexie and Annie were very close to one another growing up. After the death of their father the girl's suddenly had to fend for themselves as their mother was finding it hard enough just trying to take care of herself. Lexie quickly took care of running the household, arranging meals, trying to keep the house tidy and making sure the girl's got to school each day. Their mother remarried, but the girls couldn't warm to their stepfather, Robert at all so much so that they in fact hated him. Sisters Lexie and Annie were very close to one another growing up. After the death of their father the girl's suddenly had to fend for themselves as their mother was finding it hard enough just trying to take care of herself. Lexie quickly took care of running the household, arranging meals, trying to keep the house tidy and making sure the girl's got to school each day. Their mother remarried, but the girls couldn't warm to their stepfather, Robert at all so much so that they in fact hated him. Lexie and Annie's close bond remained, but once Lexie turned sixteen she left home wanting to form a life of her own. She wasn't sure how Annie would cope being left with her mother and stepfather, but she needed to go away. Over the years Lexie worked hard on building a career and a new life for herself. Now a successful doctor and happily engaged to Sam. Lexie hadn't heard from her sister Annie in a few years, so when she gets a call from her in the early hours of the morning she knows something is wrong. Lexie quickly discovers her sister is in deep trouble and needs her help. Can Lexie save Annie or has years of addiction done too much harm? Lexie and Annie are sisters who shared a tough upbringing in a closed fundamentalist sect after their father died and their mother remarried an elder in the sect. Plucked out of a normal, happy childhood they were made to wear long modest skirts and headscarves they were not allowed outside of the community, forbidden any media or popular books and harshly beaten by their stepfather for any small misdeamour. Lexie bowed down to this regime, gritted her teeth and ran away when she turned 16 and w Lexie and Annie are sisters who shared a tough upbringing in a closed fundamentalist sect after their father died and their mother remarried an elder in the sect. Plucked out of a normal, happy childhood they were made to wear long modest skirts and headscarves they were not allowed outside of the community, forbidden any media or popular books and harshly beaten by their stepfather for any small misdeamour. Lexie bowed down to this regime, gritted her teeth and ran away when she turned 16 and wasn't allowed any further education. Annie, on the other hand, rebelled against being disciplined and although Lexie did her best to look out for her, life got even worse for Annie when Lexie left. Now both adults and living outside the community in Alabama, their lives have taken very different paths. Lexie studied hard, became a doctor and is engaged to Sam, a surgeon and a wonderful, understanding man. Annie struggled after she left the community and eventually turned to drugs and alcohol to relieve her pain and frustration. Although Lexie tried to help Annie through several courses of rehab, nothing worked and they eventually lost touch. But now Annie is pregnant and sick and contacts Lexie as a last resort. She's still using heroin and under Alabama laws she could receive a jail sentence and have the baby taken from her for being an addict. "She is not a junkie," I choke. "She is my sister." Bring on the tears...this was a good read! Kelly Rimmer is an author who is unafraid to tackle a very topical and relevant issue in our current world climate, drug addiction. In her new novel, Before I Let You Go, Rimmer places a microscope on drug addiction, the way it is perceived by others, how it is treated in the health profession, what laws surround it and how family members choose to deal with it. It is an edgy and illuminating novel that uses the strong bond between two sisters to unfurl an emotionally complex story. Sometimes when you read a book you just inherently know that it will remain by your side for a long time to come. I have this gut feeling about Before I Let You Go, by Kelly Rimmer. I’m just so pleased I have discovered this brand new author (to me). It is a thought provoking read that challenges the very core of your moral thinking. Most of all, Before I Let You Go presents a warts and all view of addiction. There is a strong human element to the main character, Annie’s addiction and this is an account of addiction I have not experienced previously. It definitely challenged my own personal viewpoint on addiction, which I appreciated. Kelly Rimmer has produced a resolute piece of writing. Rimmer is now a writer that firmly sits on my watch list and I hold her writing in very high regard. Rimmer structures her latest novel in an interesting and highly engaging manner. We shift between two main perspectives through the book. In the present, we follow Lexie, as Annie crash lands back into her life, with the news that she is expecting a child anytime soon. In the past, we learn about Annie’s tragic past via journal entries she composes while in rehabilitation. This gives the reader a perfect insight into Annie’s frame of mind and helps to flesh out the reasons for Annie’s addiction. As well as putting the spotlight on the bond between two sisters who have shared so much, Before I Let You Go also includes an interesting by line on religious cults and the influence of the girl’s stepfather in this area of the novel. It added yet another layer to this morally complex tale. The plot is thick and it offers up so much fodder to discuss in book club situations. Before I Let You Go also zones in on addiction and the various health professionals, lawyers, hospital staff and mental health professional involved in combating this illness. I feel there is a strong overarching theme on relationships. Rimmer presents relationships in many different forms in this novel, from the love between Lexie and Sam, to the sisterly bond between Lexie and Annie. Rimmer also looks the dysfunctional relationship between Lexie and Annie and their mother. Finally, when Annie’s baby girl enters the world, Rimmer helps us see how a new baby fits into the fold. I found these passages so very real, taking me back to my own newborn experiences with my children. However, Before I Let You Go is a whole different ball game. Lexie becomes an instant mother and she must contend with a newborn who is still working through the withdrawal process. Rimmer presents this with insight and sensitivity. As a newcomer to Rimmer’s writing style I appreciated it very much. She has a great command of language, her writing is assured, but also stark and to the point. I was drawn into Before I Let You Go from the opening and I continued to turn page after page over, in the hope that Annie would be able to start a new life with her baby daughter. I don’t want to say too much more about this aspect of the novel as I don’t want to spoil it for potential readers. It is heartbreaking, raw and reflective of our current age of addiction. I wish we understood more about this illness in order to better help sufferers like Annie. The system that is present in some states in the US, where pregnant drug users find their children are taken away from them and are issued with jail time, is a different approach to managing this disease. I had not heard of until I read Before I Let You Go. I thank Kelly Rimmer for drawing my attention to this rule of law. So many feelings ran through me while reading Before I Let You Go. I shifted the blame and my sympathy levels a number of times. But, what resonated with me most, was a heartbreaking scene when Annie faced such obvious prejudice, being labelled simply as a ‘junkie’. Often we see drug users in this light and we forget that they are someone’s loved one, sister, daughter, mother or aunty. It is truly heartbreaking, not just the user, but those who surround them. Rimmer works to highlight this in her novel, perhaps informed by her own family experiences of seeing her uncle suffer and succumb to serious drug addiction. Before I Let You Go is a book that commands your attention and compels you to tread the emotionally fraught moral line in terms of addiction and pregnant users. 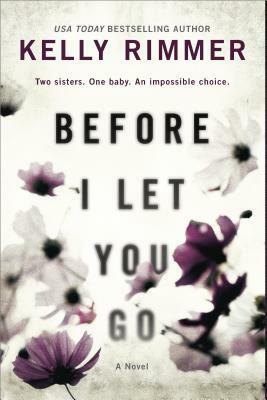 The frank writing style, the here and now setting, combined with authentic relationships between the two sisters featured in this novel, makes Before I Let You Go a book I recommend many times over. This was SO well-written, emotional and heart-breaking. The story of two sisters, Anna, who struggles with addiction, and Lexi, who struggles with how to be emotionally honest with those around her. Anna calls in the night, pregnant and medically in trouble. The two sisters are drawn back together in yet another attempt to help Anna’s sobriety stick, this time with a third life in the mix. Told in dual perspectives and dual timelines with Lexi narrating in the present, and Anna telling the heart This was SO well-written, emotional and heart-breaking. The story of two sisters, Anna, who struggles with addiction, and Lexi, who struggles with how to be emotionally honest with those around her. Anna calls in the night, pregnant and medically in trouble. The two sisters are drawn back together in yet another attempt to help Anna’s sobriety stick, this time with a third life in the mix. Told in dual perspectives and dual timelines with Lexi narrating in the present, and Anna telling the heartbreaking story of their past, this is one of the best books of the disease of addiction and its effect on families. Kelly Rimmer is fast becoming one of my favorite family drama authors. She gets down into the messy details and continually tugs at your heart strings. I don’t think I have read anything by her that hasn’t left me a sobbing mess at the end. The story is told in alternating viewpoints between Lexi & Annie, which allows you to really get to know these sisters. Both of these women are so damaged, but you just cannot help but feel for them. I spent plenty of time shaking my head at their continually poor decisions, but regardless, I felt for them and felt quite bonded to these characters. There are a lot of heavy topics in this novel: drug abuse, physical abuse, addiction in adults and newborn infants, there isn’t much that Rimmer doesn’t throw at us in Before I Let You Go. However, all of this comes together to create quite a poignant story of 2 sisters and the depths of love and family. Highly recommended (with a side of tissues). The drug crisis in the US is overwhelmingly horrific, I have way too many friends and family members who have struggled with addiction and it is such an ugly and awful disease. This book is uncomfortable. This book is heartbreaking. This book is also incredibly important and beautifully poignant. It sheds light on a dark corner of society, that of the pregnant drug addict. The current protocols and procedures in place regarding how to legally handle situations where a mother gives birth to an ad The drug crisis in the US is overwhelmingly horrific, I have way too many friends and family members who have struggled with addiction and it is such an ugly and awful disease. This book is uncomfortable. This book is heartbreaking. This book is also incredibly important and beautifully poignant. It sheds light on a dark corner of society, that of the pregnant drug addict. The current protocols and procedures in place regarding how to legally handle situations where a mother gives birth to an admitted baby are shocking and utterly unhelpful, definitely eye opening for me. Rimmer is such a gifted writer, there is no one better to write about such a topic. This is told from two viewpoints, sisters Lexie and Annie. Lexie is a successful doctor who is engaged to an amazing man, seriously everyone deserves a man like Sam. Lexie’s chapters are told in the present day starting immediately after Annie calls to tell her she’s eight months pregnant and scared because she’s still been using heroin and she thinks something is really wrong. Annie’s chapters are told via journal entries that explain her road to drug abuse and events in her childhood that led her down a dark road. My heart broke for both of these women, both of their stories were painfully raw and so very honest. They are gorgeously drawn and complex characters, I can’t say enough about how invested I was in their lives. This reminded me of a Jodi Piccoult book, it has the same emotionally charged plot coupled with extremely strong writing, this book is phenomenal. You will need tissues, it’s a total tear jerker so be warned. I’m calling it a must read and it’s going right into my top books of the year list. Before I Let You Go in three words: Heart-wrenching, Emotional and Powerful. Before I Go is a poignant novel about family and unexpected changes. The story begins with Annie reaching out to her sister Lexie right before the birth of her (drug addicted) baby. Lexie agrees to kinship care while Annie deals with the legal ramifications of doing drugs while pregnant (and also agreeing to rehab). The present situation is told from Lexie’s POV while Annie’s chapters delve into the past. Their dad died when they were young and their mom remarried a man name Robert who brings th Before I Go is a poignant novel about family and unexpected changes. The story begins with Annie reaching out to her sister Lexie right before the birth of her (drug addicted) baby. Lexie agrees to kinship care while Annie deals with the legal ramifications of doing drugs while pregnant (and also agreeing to rehab). The present situation is told from Lexie’s POV while Annie’s chapters delve into the past. Their dad died when they were young and their mom remarried a man name Robert who brings them to a religious community which strongly resembles a cult. Through Annie’s “journal” entries we learn of the suppression, control, and abuse they (Annie especially) suffered at the hand of Robert and others. As Lexie adjusts to taking care of an infant, Annie struggles in rehab. They have a very codependent relationship that was interesting (and often times frustrating) to read about. I have to say I grew irritated with the way Lexie treated Sam, her fiancé. He was so kind and supportive of her family situation and yet she just kept pushing him away and being defensive. At one point Sam tells her “sometimes, I think you don’t know me at all,” and honestly, many times it felt that way.